Now that the colder months are here, you may be dealing with runny noses, sore throats, and symptoms of the flu. Everyone has their own cure, but did you know some of these common remedies can actually have a negative affect on your oral health? Keep reading to discover how common solutions for winter illness can affect your smile. Additionally, learn some cold and flu tips so you can combat sickness without damaging your teeth. Cough drops and products like them are made to dissolve slowly to provide relief for your throat. The problem is that many of these lozenges contain sugar, which coats your mouth and gets inside of your saliva. Because cough drops dissolve slowly, it allows the sugar to be in contact with your teeth for long periods of time. Your best bet is to choose sugar-free cough drops. They still taste great, but they won’t leave you susceptible to cavities and decay. If you simply must have your sugary sweet relief, be sure to brush your teeth afterwards to clean the sugar out of your mouth. Just like cough drops, a lot of liquid medicine contains sugar to make it easier to drink. These liquids are thick and sticky, which makes them stick to your teeth with ease. Some of these products also have alcohol, which causes dry mouth. Without saliva flow, it makes it much harder to wash the sugary syrup away. To avoid these problems altogether, try using pills or gel-capsules instead of liquid medicine. If you’re prescribed liquid medicine or it’s the only solution that works for you, drink it around meal time. Eating and drinking stimulates saliva flow, which will help rinse out some of the sugar leftover. Decongestants come in handy when you have a runny nose. They work by drying your nose out, but did you know they dry your mouth out too? Dry mouth promotes the growth of bacteria that leads to decay and gum disease. Lucky for you, decongestant use is temporary. You can take these products while also focusing on keeping your mouth lubricated by drinking plenty of water and chewing sugar-free gum. A common go-to remedy for colds and other sickness, hot tea is great for soothing throats. This drink is better for your teeth than other beverages like juice and soda, but it still comes with some oral health risks. Specifically, black tea can cause significant enamel erosion compared to green tea. The best way to help your teeth while still enjoying a cup of tea is to use a straw. Drinking through a straw will minimize the contact that the tea has with your teeth. Just be sure to brush after, especially before bed. 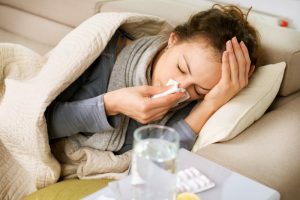 Now that you know how a few common cold and flu remedies can affect your teeth, you’re ready for the season of sickness! Use the above tips from your local dentist to keep your teeth healthy, while still getting relief! Dr. Megan A. Shelton enjoys providing high quality dentistry to her patients in Carlsbad. She believes in patient education, which is why she wants you to know the oral health risks you may face with common cold remedies. She currently practices at Polished General Dentistry, and she can be contacted through her website or by phone at (760) 434-9800 for any questions.